Walk to Lifts, Mtn View, Pool, Hot Tub, Underground Parking! At Ski Run you will enjoy a great view of Keystone Mountain from your deck! A short 5 minute walk will have you at the Peru lift at the Mountain House base which offers terrain for all levels of skiers. Our conveniently located condo is truly our home away from home. It is well-appointed and offers amenities such as condiments and paper products that you won't find elsewhere. We continually strive to keep our unit upgraded. You'll enjoy granite countertops, stainless appliances, new lighting, new bedding, etc. Our unit has a king-size bed in the master, a queen-size bed in the second bedroom (this is a loft) and three single beds in a third bedroom. It is best-suited for families. Maximum occupancy is seven persons. FREE shuttle buses serve all Summit County ski areas. Several restuarants are within walking distance. There are also several ski rental shops within walking distance. We are avid skiers and typically get on the mountain around 20 days per season. Unfortunately we are mainly limited to the weekends which means we generally only have mid-week availability in our condo. The great news is that we can offer reasonable prices for mid week rentals! As the reviews attest, we have a great unit and we are easy to work with! We are Geoff Hiland and Kristen (Hiland) Bergeson, brother and sister, natives to Colorado. This condo has been an integral part of our family and our lives since the 1980s. Growing up as ski racers, our family spent countless weekends either training or racing from October through March every winter. As we grew older, the condo became the party pad where we hung out with friends. Now we have families of our own and the cycle is beginning all over again. We hope you'll enjoy our condo as much as we do. Keystone is an ideal location due to its proximity to Denver and the front range, plus it is an easy drive to several other mountain locales including Breckenridge, Copper Mtn, Vail and Beaver Creek. During the winter, Keystone is a family-friendly mountain with great terrain for all abilities. In the summer there are also plenty of activities including beer and wine festivals, biking and hiking. Great view of Keystone mountain. Walk to Mountain House base area in approximately 5 minutes - this base area offers terrain for everyone and if you don't ski, you can watch others in your group in kids ski school or on the beginner slopes. We use our condo frequently so we want to make sure it has everything we and YOU need to enjoy your stay. That includes cookware, crock pot, coffee maker, etc. We also ensure we have plenty of TP, paper towels, dish soap, laundry soap, condiments, some spices, etc. Our balcony overlooks Keystone Mountain. While not immediately on the slopes, we are a short 5-10 minute walk to the Mountain House base of Keystone. Great views of Keystone mountain from third floor balcony. Dining table seats 6 with 3 additional bar stools. 2 booster seats available for child or infant. Our balcony offers great views of Keystone Mountain. 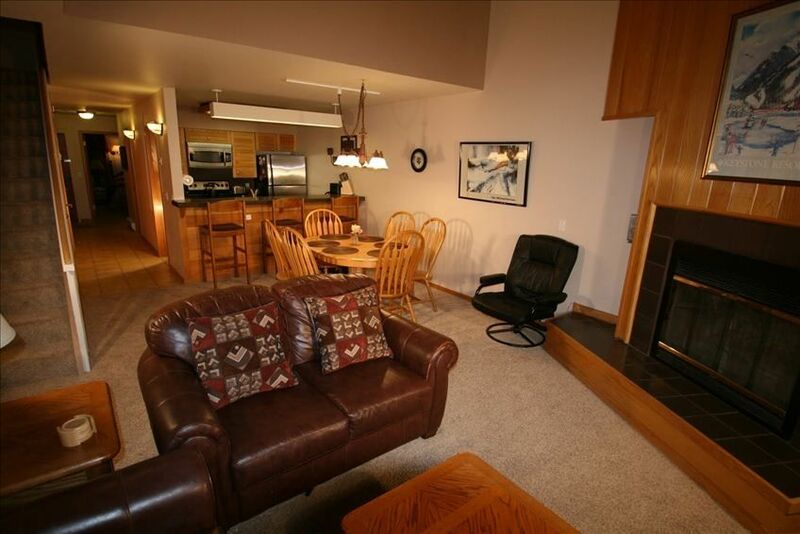 We are conveniently located within a 5-10 minute walk to the base of Keystone Resort. We had a great stay. The amenities were some of the best we’ve ever had. We loved the view morning and night. Walking distance from lots of activities. We’ll stay here again when we return to Keystone. Contact with the owner was always quick and efficient. Thanks! We loved staying in this clean, well maintained, pet friendly condo. Owners were proactive in getting us in and responsive to questions. During our summer stay we enjoyed nice walks, watching movies on their great tv, and cooking our fun meals in their nicely appointed kitchen. The complex had Mutt Mitt stations to make it easy with our dogs. Great location, ample space, and equipped with all essentials needed to cook in the kitchen! (spices, condiments, decent cookware and a grill on the deck!) We liked the walking areas and took advantage of the hot tub too! The hosts were very accommodating and responded quickly. We loved this condo. Can’t wait for next year! Kristen's condo was perfect for our two families. It has a fireplace, balcony with a great view, laundry, pool/hot tub next door, and best of all is a nice walk to the Mountain House base area. The kitchen is fully equipped and we cooked in a lot. Condo was very clean and well equipped! Owners were very easy to work with. Location was handy, we enjoyed taking "day trips" to area villages. We weren't there during the busy ski season, so the area was pretty quiet. We'd stay there again.